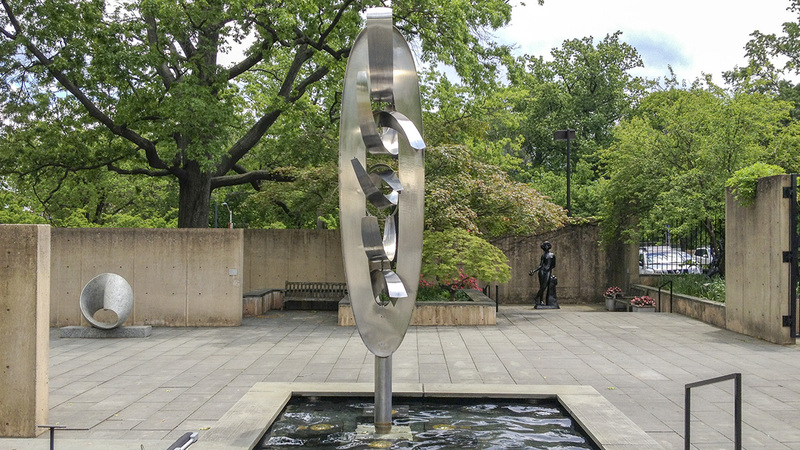 Designed in 1980 by George Patton, the 1.1-acre sculpture garden within the Baltimore Museum of Art was designed to hold the personal collection of the late Alan and Janet Wurtzburger. 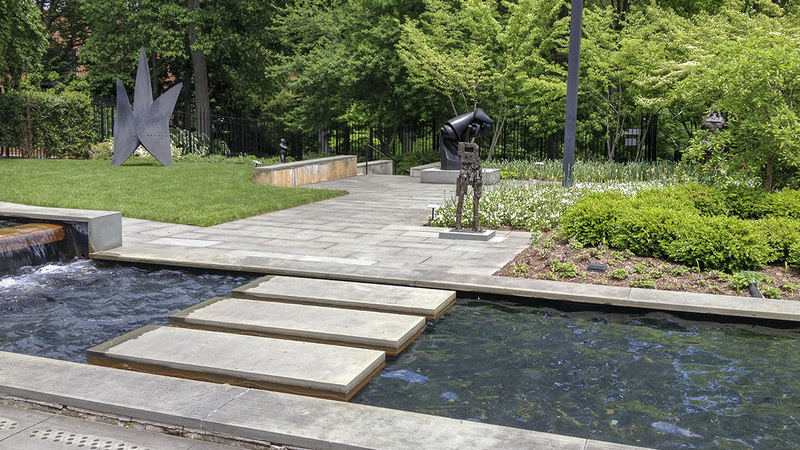 Providing a 100-year survey of sculpture, from the figural to the abstract, the collection was initially displayed at Timberlane, the Wurtzburgers’ well-shaded private estate in Baltimore County. 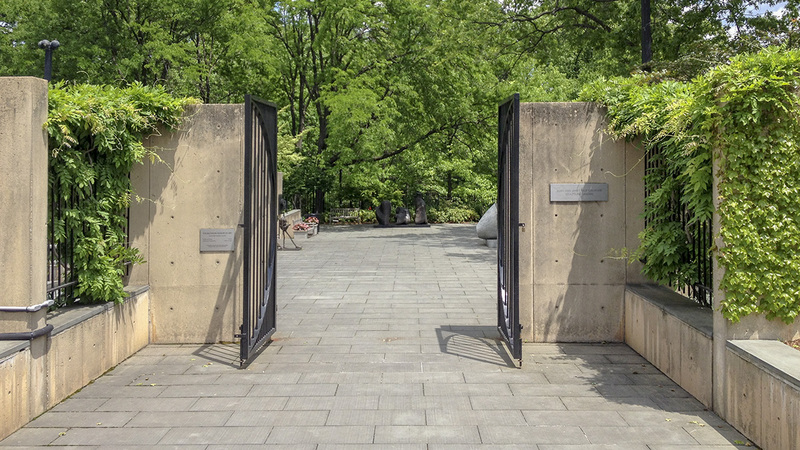 Nestled between the museum café and a parking lot, the irregularly shaped garden, home to 34 sculptures, is entered through a formal, iron-gated entrance framed by concrete walls that become asymmetrical planting beds. 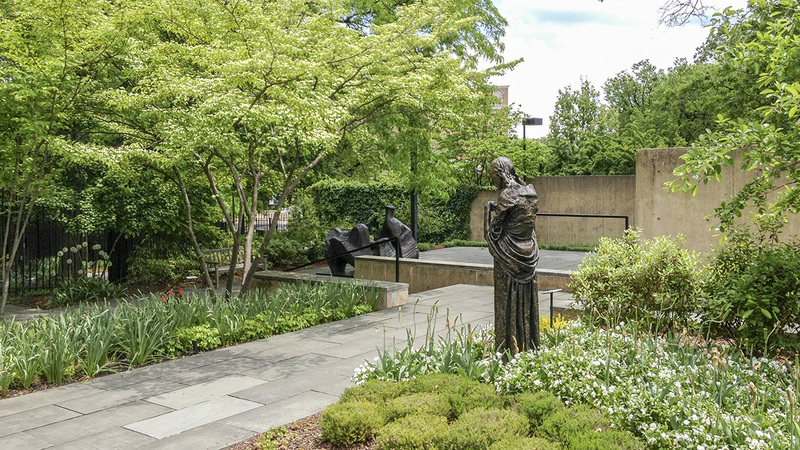 Echoing the verdant setting of the erstwhile estate, the walled-in garden, with its graduated bluestone terraces against the backdrop of the John Hopkins University dell, features plantings of birch, willow oaks, and boxwood. 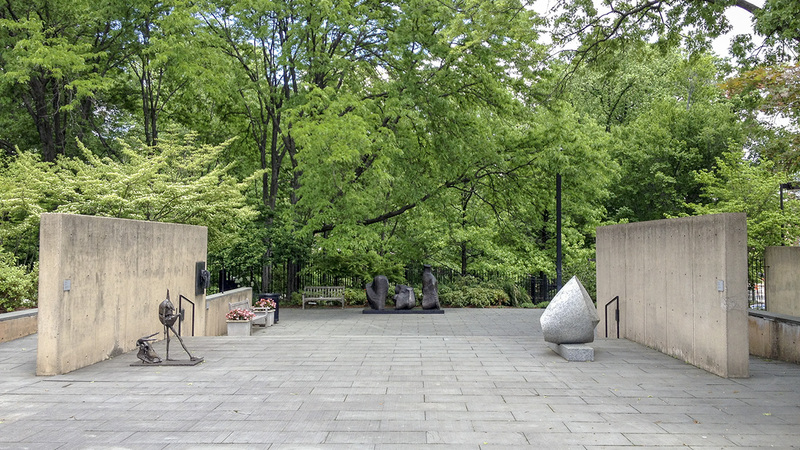 The perforated concrete walls, planting beds, and resultant enclaves provide a stark backdrop to the sculptures, many of which are by postwar artists, including Marini, Lipchitz, and Zadkine. 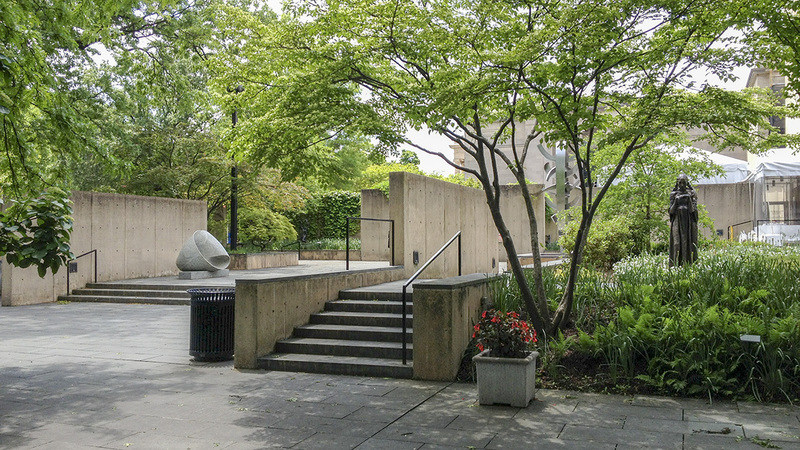 The focal point of the landscape is a fountain with a stepping-stone bridge and a two-level linear reflecting pool, which contains the ear-shaped Isamu Noguchi sculpture Untitled (1958). The large flower bed near the café and the pool accent the entrances and seating areas. 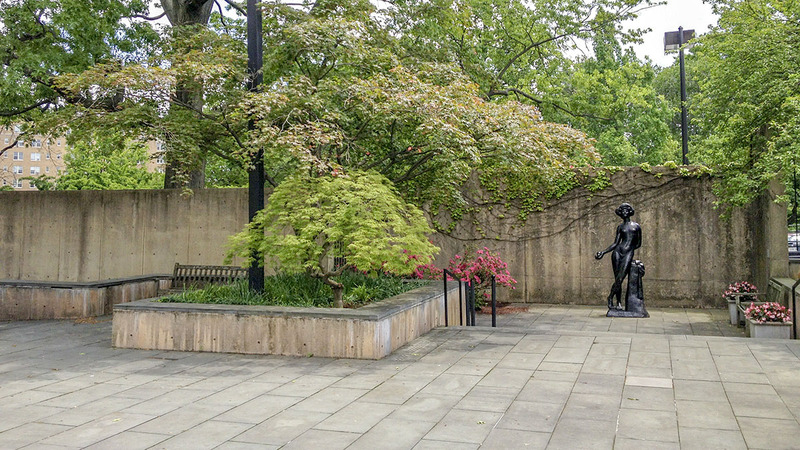 Evergreen trees and hedges help to provide spatial definition and year-round greenery, while perennials and flowers offer a softer, colorful backdrop that changes through the seasons. 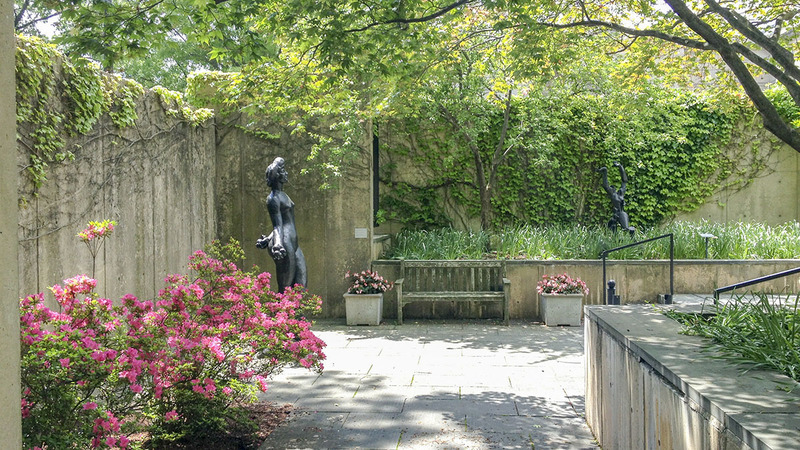 The garden simultaneously acts as a transitional space to the Ryda and Robert H. Levi Sculpture Garden, which was installed on an adjacent plot outside the museum in 1988.